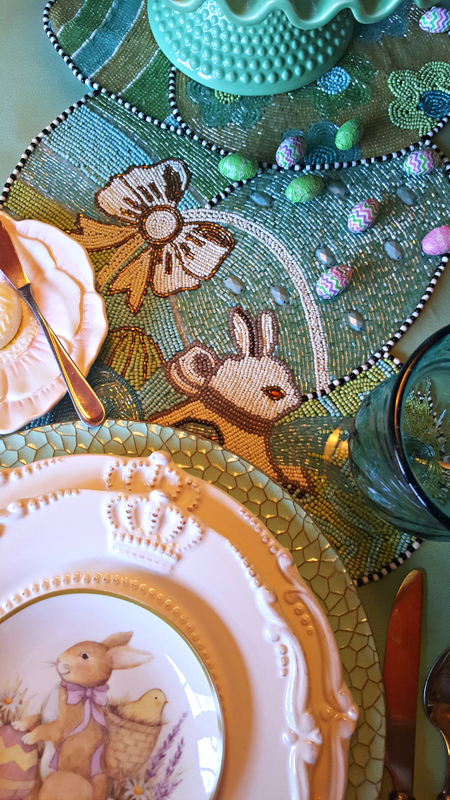 A playful Easter table for Brunch. Easter falls on my birthday this year, so double the celebration. Growing being an April Fool's baby, I was subjected to silly jokes. Pretty minty green, aqua and turquoise make this a spring favorite. The crown plates are a favorite of mine. I love these damask napkins. They never wrinkle. 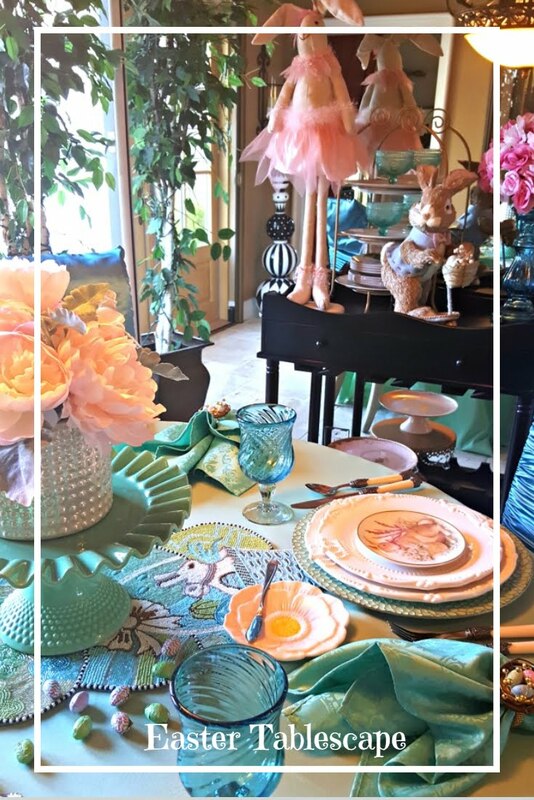 The cute easter egg nest adds a touch of whimsy. Gotta add the cute little butter pats made with molds. The runner is a Mackenzie Childs Easter runner I bought on sale. t help but love them all. 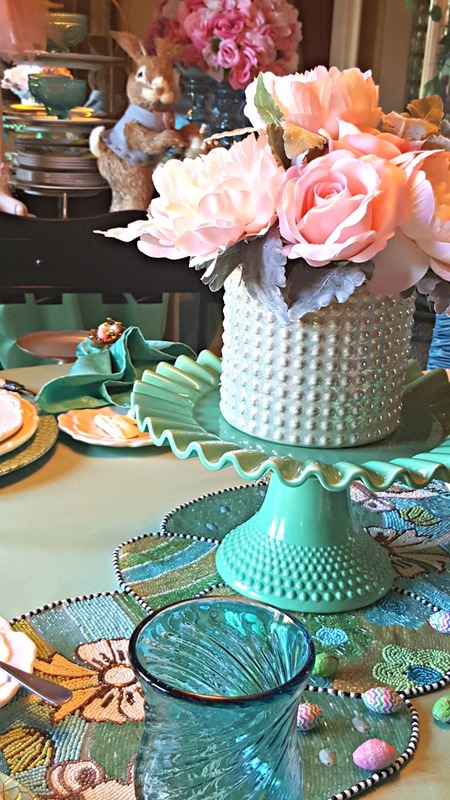 Adding the pink peonies is so romantic and pretty on top of my mint green cake stand. You can find me at some of these parties. There's SO much about this table that I love! 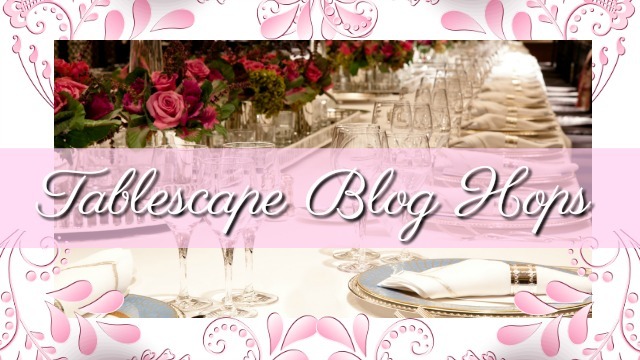 The beaded runner, the bird's nest napkin holders, the hobnail glass, the butter lamb! 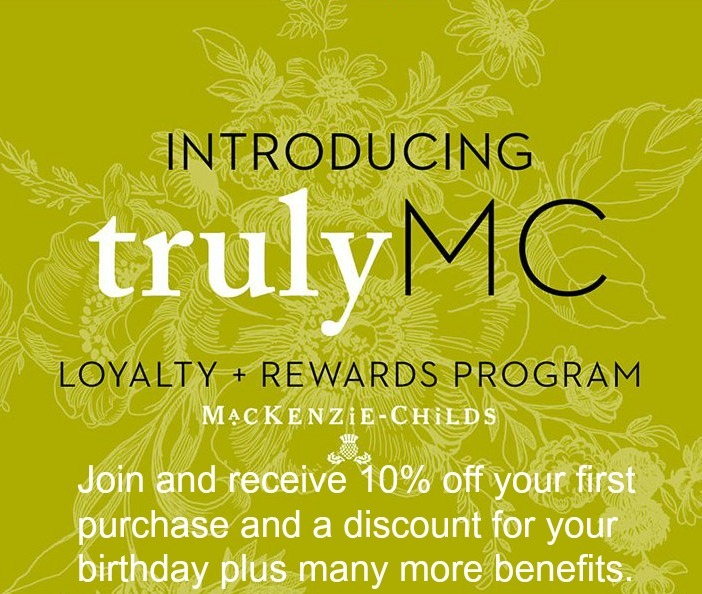 And Happy April Fools/Easter Birthday to you -- a triple whammy! So so pretty, Linda! My favourite colours make your table a delight for these green eyes! Wishing you a Happy birthday as well as a Happy Easter. Lots to celebrate! Happy Birthday and Happy Easter Linda! 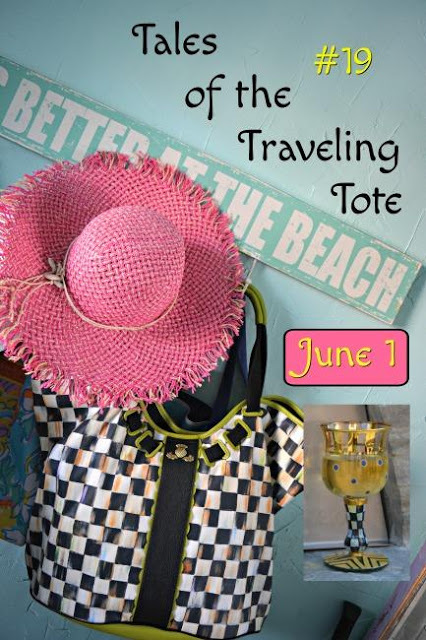 Your table is gorgeous and fun at the same time! I have always wanted those crown plates, so elegant! 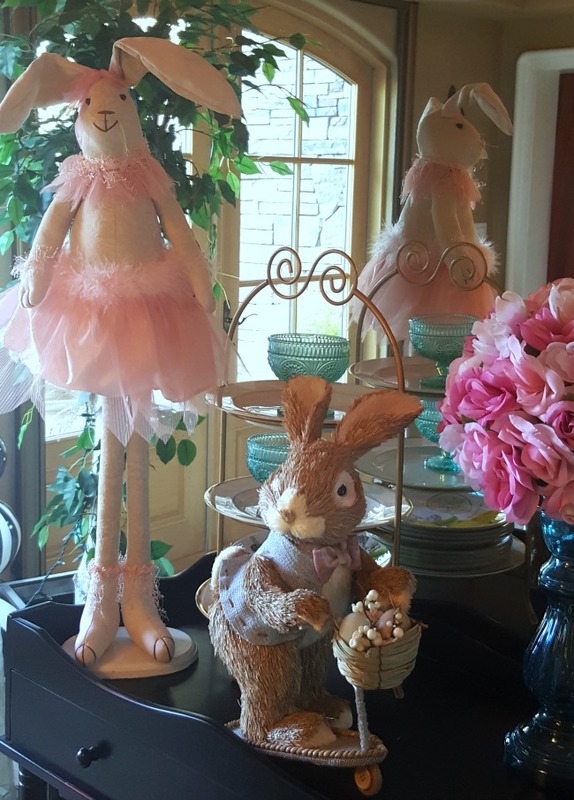 Your bunnies are having a ball, I especially love the tall pink ballerina! 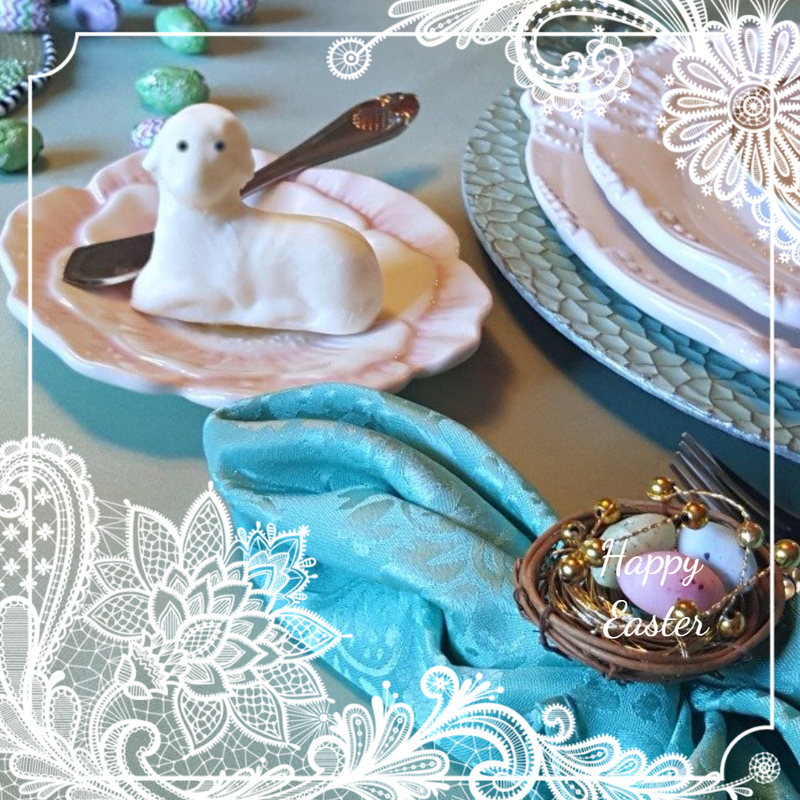 Those napkin rings are adorable, and your molded butter is the icing on this Easter scene! Have a wonderful weekend, no fooling! 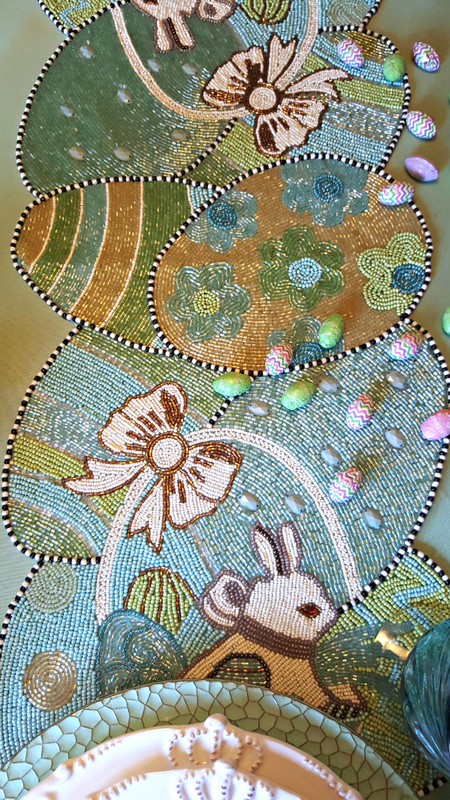 The beaded table runner is beautiful! As usual impeccable decorations! I love the colors you chose for your table. The aqua plate stand is my favorite! The MC runner is beautiful. Wishing you a very Happy Easter and Birthday! 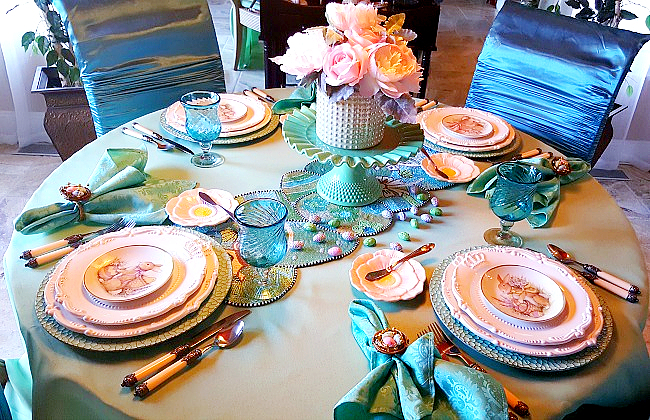 Love all the pretty colors in your beautiful table setting! Looks like the colors of Easter for sure! Hope you have a wonderful birthday and Happy Easter on the first! 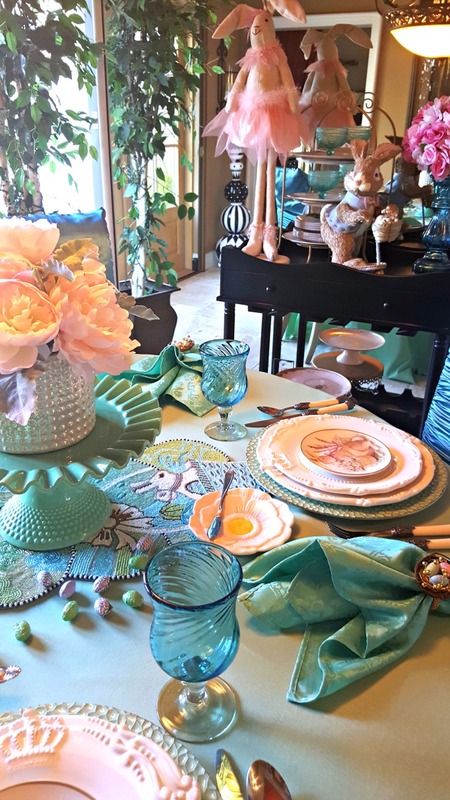 Such a pretty table with great details,Linda. Love the colors. Adorable plates, runner and eggs. The cake plate is fabulous! Have a great birthday and Easter! Love it all Linda. Just so bright and pretty for Easter. Have a wonderful birthday. Happy Easter. Linda, if I loved those plates any more, I’m sure I’d be facing a lengthy jail sentence!!! 🤣🤣🤣 I have them in the kind of beige color, but pink is MY color!!! There is NO color on the wheel that makes me happier! With the cool crowns...even better!!! My husband’s daughter’s baby is an “April Fool’s baby” and will be celebrating birthday #2 this weekend. It’s a wonderful distinction that is like no other! Happy Birthday and Happy Easterr to you and your family!!! 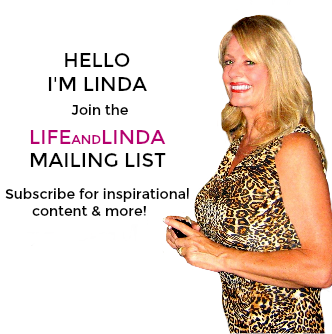 I love the combination of the pink peonies and away, Linda. It's beautiful! this table is gorgeous! 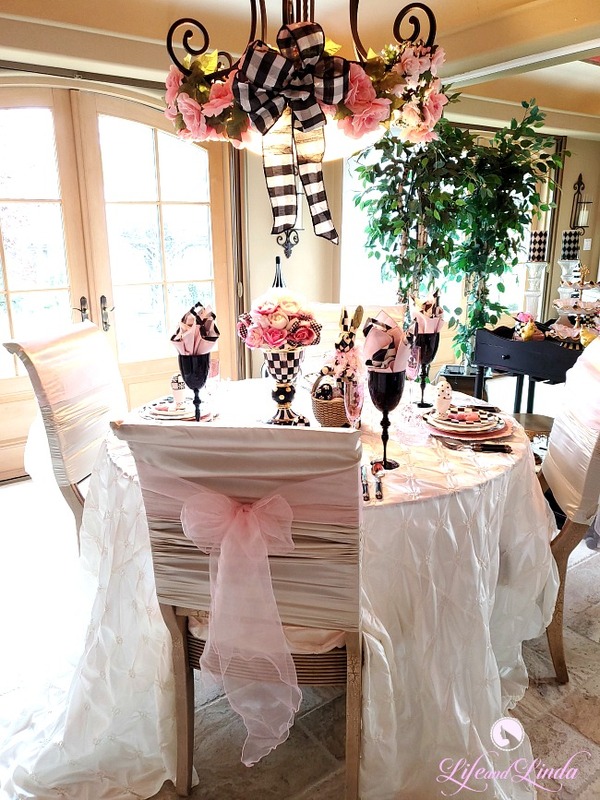 I love the plates and the table runner ... so lovely everything! So have a happy easter, and it will be your Birthday too, have a lovely Birthday as well and enjoy the time with family and friends! 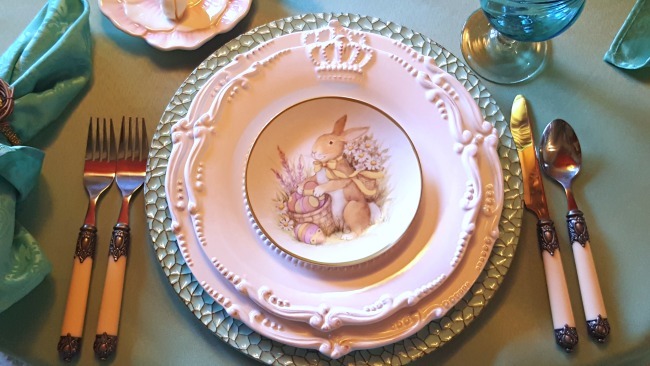 Everything looks so cute and the plate with te rabbit is wonderful!! Beautiful arrangement, Linda! 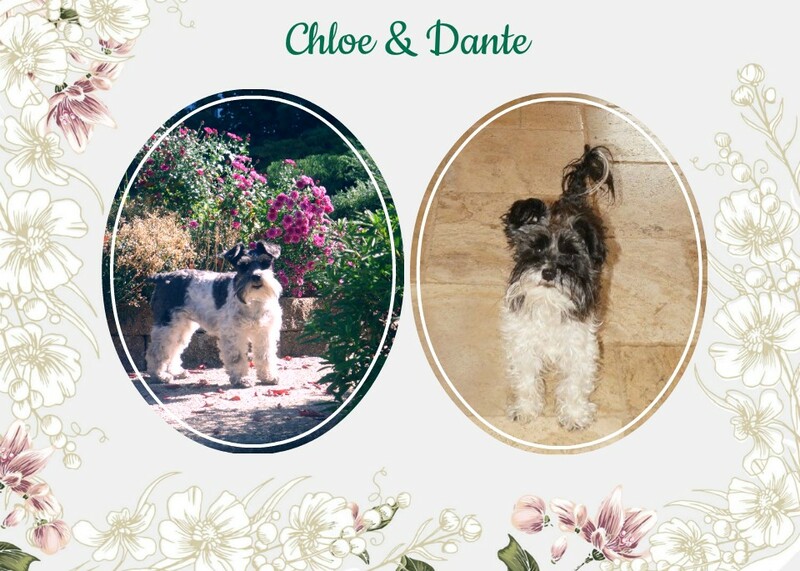 I'm part of a team co-hosting a Spring & Easter Joys link party. You've had several terrific posts, and I hope you'll link them so others can see them too! Pretty table - love your cake plate!! Have a great Easter weekend! I am not foolin when I wish you a very Happy Birthday! 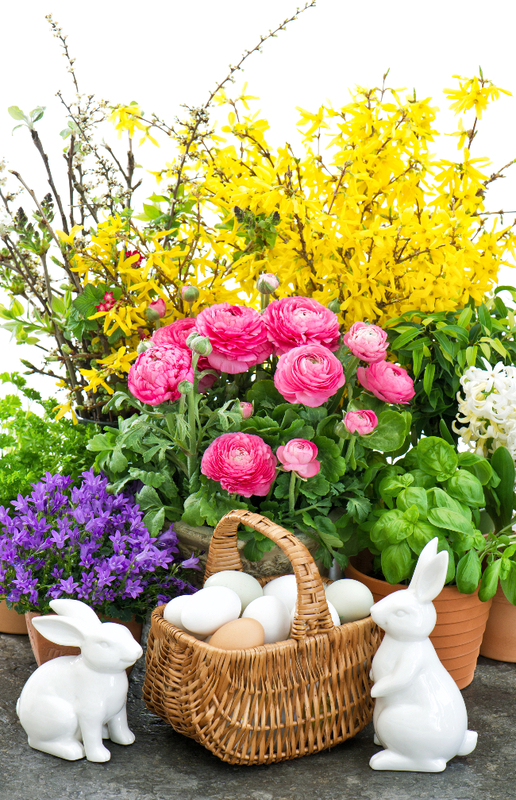 Thank you so very much for linking to the Spring and Easter Joys party. Have a very Happy Easter! Happy Birthday! Your table is gorgeous, Linda! Have a wonderful and blessed Easter. Every element of this table is exquisite! 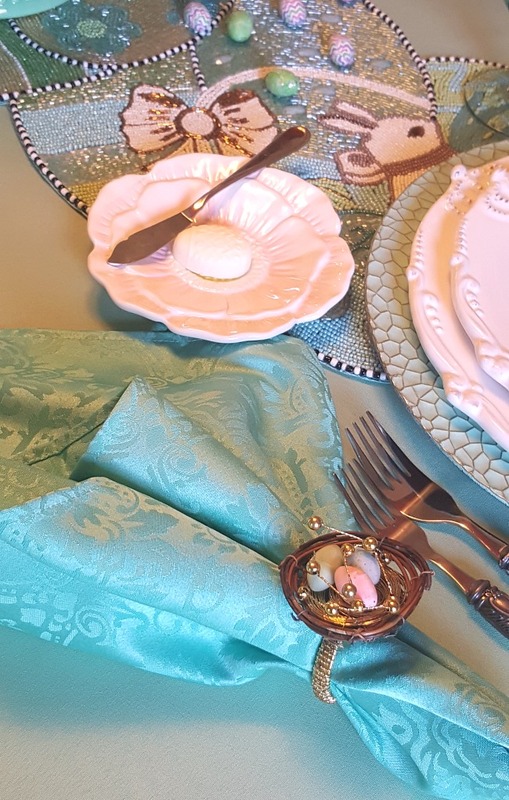 I LOVE the beaded runner as well as the nest napkin rings! Where did you find them? The colors on the table are beautiful. Love that aqua cake stand too! Beautifully done, as always. Belated happy birthday!!!!!!!!!!!!!!! !